As Parent Engagement consultant for my school board (@HWDSB) I am passionate about making learning visible to parents, to make physical brick and mortar walls transparent, and to actively engage parents in the education and learning of their children. Now, when I say “engage” I don’t mean information conveyance through classical means such as newsletters (although they have their place), school signage or blanket invitations to school events, orientation nights, or fund raisers. When I say “engage” I mean actively interacting with parents, asking them what they need (rather than presuming the same) and giving them opportunities to roll their sleeves up and be part of the educational process. 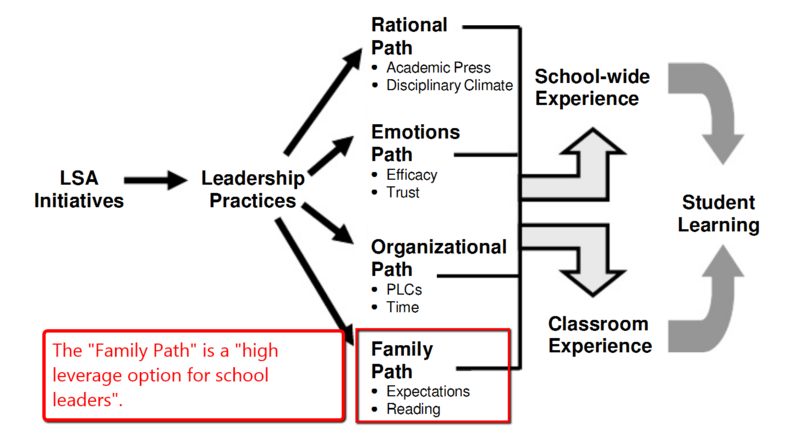 By this definition (parent involvement), then, parents are passive participants in the education and learning process of their children, they do not necessarily understand the language or processes of learning and are subject to knowing only what is provided to them by the teachers and schools as perceived experts. Who, though, is more of an expert in regards to the children in our classrooms than the parents themselves? Surely those parents have tons of information to offer in regards to the development and growth of the children they live with everyday. In fact, those parents are as much educators as those holding the role in classrooms. The subject matter may differ but the impact is profound. As we know that a parent’s engagement in their child’s learning significantly impacts the achievement and growth of each child, what are some other ways that we can facilitate this? Many parents are not able to spend significant time at school, so how can we do more to bring them in on their child’s learning? With easy access to technology, are there better ways that we can provide opportunities for parents to be more connected with this learning at home? This is the lens through which I look at many things in education. I understand that technology does not engage all and is not the right enabler in all situations but in a growing and dynamic digital age I believe that we have a responsibility to harness the power that is available rather than letting that vital resource remain untapped merely because we don’t all understand how to use it. Engagement,” in comparison to involvement, comes from en, meaning “make,” and gage, meaning “pledge” – to make a pledge (Harper, 2002), to make a moral commitment (Sykes, 1976, p. 343). The word engagement is further defined as “contact by fitting together; … the meshing of gears” (Engagement). The implication is that the person ‘engaged’ is an integral and essential part of a process, brought into the act because of care and commitment. By extension, engagement implies enabling parents to take their place alongside educators in the schooling of their children, fitting together their knowledge of children, teaching and learning, with teachers’ knowledge. With parent engagement, possibilities are created for the structure of schooling to be flattened, power and authority to be shared by educators and parents, and the agenda being served to be mutually determined and mutually beneficial. (Pushor & Ruitenberg, 2005, pp. 12-13) In this changed script, there is no longer a protectorate, no longer a protector and a protected. No longer are educators entering a community to claim the ground of school. No longer are educators working alone to design and enact policies, procedures, programs, schedules and routines for the sole benefit of the children of the community. Instead, educators are entering a community to create with parents a shared world on the ground of school – a world in which “parent knowledge” and teacher knowledge both inform decision-making, the determination of agendas, and the intended outcomes of their efforts for children, families, the community and the school. Both educators and parents wear badges which mark their knowing and their expertise. There is a sense of reciprocity in their mutual engagement, a sense of benefit for families and the school. One way we could actively receive input with parents is through social media (a topic I will explore in part 2 of this post). Social media and digital tools, however, are not THE answer as we must remember that “…some families have far more resources than others to be involved in productive ways. Families facing poverty, linguistic and cultural diversity, unemployment and housing instability typically have considerable difficulty finding those resources.” (Leithwood, 2010, p.11) One could argue, however, that even those families that struggle financially have some access to technology either on their persons, in their homes, or in the community. Further, technology can help to bridge communication barriers between multi-lingustic and cultural groups. 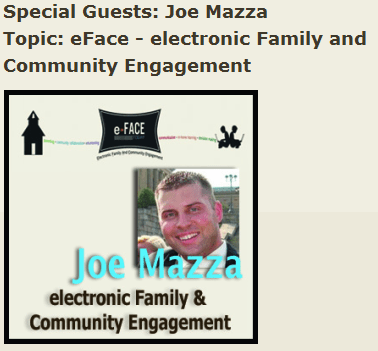 Technology and digital tools will never replace face-to-face but I like how @Joe_Mazza referred to eFace in his presentation “electronic Family and Community Engagement”. It really is a blend of electronic and face-to-face. Here are links to Joe’s presentation – I’ll refer to them more in the next post. Creemers, B. P. M., & Reezigt, G. J. (1996). School level conditions affecting theeffectiveness of instruction. School Effectiveness and School Improvement (7),197-228. Kellaghan, T., Sloane, K., Alvarez, B. & Bloom, B.S. (1993). The home environment and school learning. San Francisco, CA: Jossey-Bass Publishers. McGilp, J. & Michael, M. (1994). The home-school connection: Guidelines for working with parents. Portsmouth, NH: Heinemann. Pushor, D., Ruitenberg, C., with co-researchers from Princess Alexandra Community School. (2005, November). Parent engagement and leadership. Research report, project #134, Dr. Stirling McDowell Foundation for Research into Teaching, Saskatoon, SK, 79 pp. Sykes, J.B. (Ed.). (1976). The concise Oxford English dictionary (6th ed.). London: Oxford University Press. Thanks Aaron for joining us today on Classroom20 Live. Joe Mazza certainly is an inspiration and there were lots of good ideas shared in the chat. I am really impressed and amazed at the collection of resources and research on parent engagement and parent involvement that you have described in your blog post. It is so nice to see this conversation all in one place. I am looking forward to the second part of this post. HWDSB is very fortunate to have you in the role as Parent Engagement consultant. There are many parents wondering when their boards will have the same support. HWDSB is a real leader in all things technical as well as parent engagement. HURRAH !! Aaron, I love this post of yours! I’m very passionate about parent engagement too, and I think that there’s tremendous value in making a real link between the parents and the school. Technology can be a great way to do this (and I’ve certainly used technology in this way in my own teaching situation), but it doesn’t need to be the only way. Equity is an incredibly important consideration here, and having opportunities to talk with parents, engage in discussions, and hear what they have to say is crucial. Ensuring that parents with English as their second language also have a voice in these discussions is very important. In the past, I know that we’ve had translators at different school events and meetings, which can help. I’ve even had siblings come along to school events, so that parents can feel comfortable speaking in their first language, and the siblings have acted as translators. It’s been great! I’m excited to read your next post and find out what other resources and ideas you have to share! Glad I get the chance to work in the same Board as you and learn from you both online and in person. I’m also glad that I saw your tweet today about Joe Mazza’s presentation, as Joe had tons of great ideas to share in his presentation, which you’ve definitely captured here. Thanks Aaron for continuing to have me think tonight! Aaron- Thanks for participating today and also for thinking further on the challenges. I hope you can be a consistent contributor to #ptchat on Twitter and join us on Wednesday nights! We need to continue to share ideas and customize them to fit each of our varying needs each day. It was such a pleasure to read your posts and follow-up. Thanks also Lorna & Aviva- always feed off your passion and love your generous resource sharing!